ICICI Bank Debit Card comes with an extra feature which enables users to process the transactions with additional security. 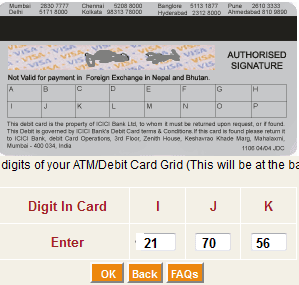 The debit card from ICICI bank has a grid printed on the backside below the signature panel and in the grid; there is a one or two digit number which corresponds to an alphabet. The user needs to enter the numbers corresponding to the alphabets to process the transactions. If you are trying to make the transactions through ICICI bank debit card if you are unable to find the grid number then this article is for you as we have published a How to Guide to help you with the process. 1. The process is fairly simple. All you have to do is that in the payment mode you have to select the net banking and enter the details of the net banking credentials. 3. Now, turn around your debit card and check the grid below the signature panel. From the grid, input the corresponding numbers to the alphabets and click on submit button. 4. It is important to enter the correct number corresponding to the alphabets as that is the security code which is verified in order to carry out a transaction. Once you have clicked on the submit button, the transaction will be complete. Grid Number is an additional feature offered by ICICI bank along with their Debit card and it is important for you that you should not share the debit card details with anyone so as to ensure that there are no unauthorized transactions from your debit card.